The LG G3 has arrived! Nearly 9 months after LG introduced the world to its 5.2-inch G2, one of the most compact devices for its size, it ups the ante again this year, now with the 5.5-inch LG G3. The new LG flagship continues the tradition of small bezels with an impressive screen-to-size ratio, but this time it’s not all about compactness - the G3 also scores a first with its Quad HD (2560 x 1440-pixel) super-sharp screen. Apart from this one big difference, the new LG G3 also adds a number of improvements over the G2, including the latest and most powerful quad-core Snapdragon 801, and a new laser auto-focus assist light for the camera. 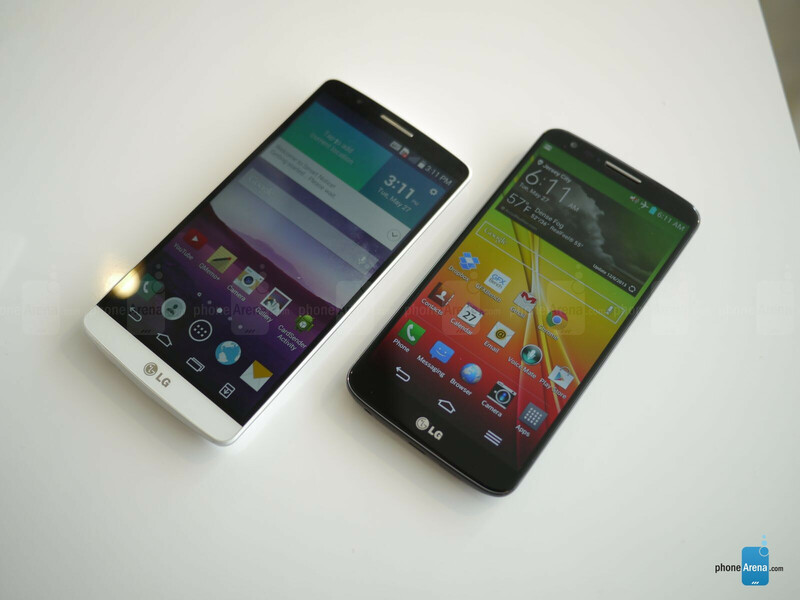 We explore all the novelties in the G3 and how it compares to the G2 below. The G2 started a brand new design series at LG, with the physical volume and lock buttons moved to the back of the device. This experiment has obviously turned out good for LG, since the LG G3 continues on that tradition. One area where LG needed to improve more was the actual build quality - the glossy plastic of the G2 was not very awe-inspiring in terms of looks, but the bigger problem seemed to be that the phone did not feel particularly tightly put together and screaked a bit under pressure. 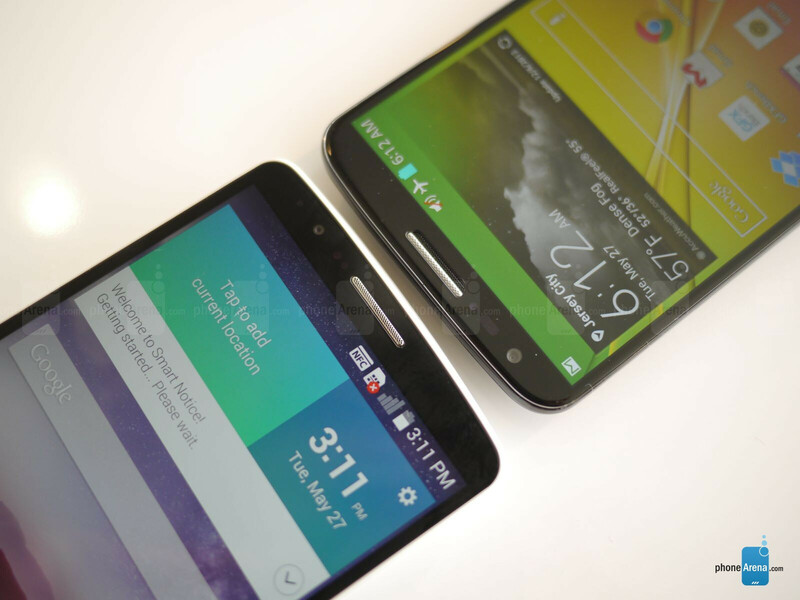 In the LG G3, this issue seems to have been addressed, and that’s welcome. 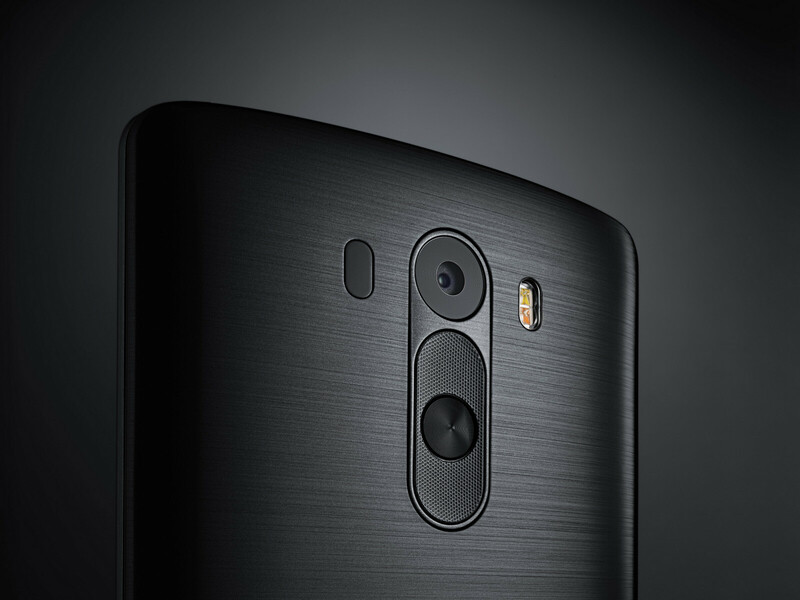 The new G3 also sports a slightly different body - it’s still made of plastic, but it has what LG calls “polished metallic skin” that looks fairly similar to the outwards appearance of the One (M8). As a bonus, it catches less fingerprints. On the back, you have the lock keys that have evolved in appearance, getting this mesh-like finish, and above them is the camera, with the new laser auto-focus assist light and dual camera flash. The elephant in the room, however, is clearly size. As compact as the LG G3 is for its 5.5-inch display, it’s still a large phone - just a bit smaller than most phablets, it’s taller and wider than last year’s LG G2. At such a size, ergonomics start taking a hit, especially when it comes to single-handed operation, so while we don’t consider this a problem, it’s still something you need to keep in mind about the G3. 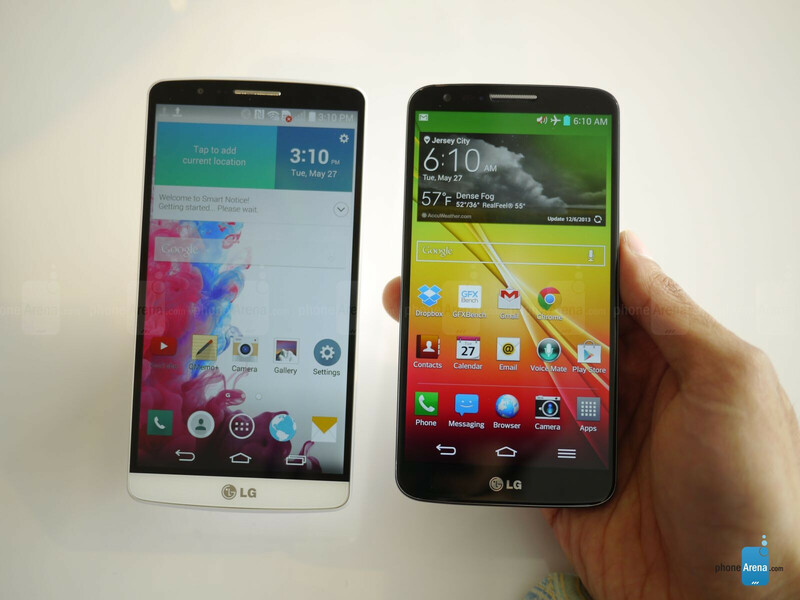 The 5.5-inch Quad HD (2560 x 1440-pixel) display is the pride and joy of the LG G3. This is the first handset outside of China to ship with such a high-res panel, and everything on it really looks razor sharp and you can read even tiniest fonts with ease. Pixel density stands at the whopping 534ppi on the G3, while the 1080p 5.2” display on the G2 clocked in at 423ppi. Putting them side to side, though, this difference is barely noticeable from a regular viewing distance - you have to look from really up close to start noticing minute details. 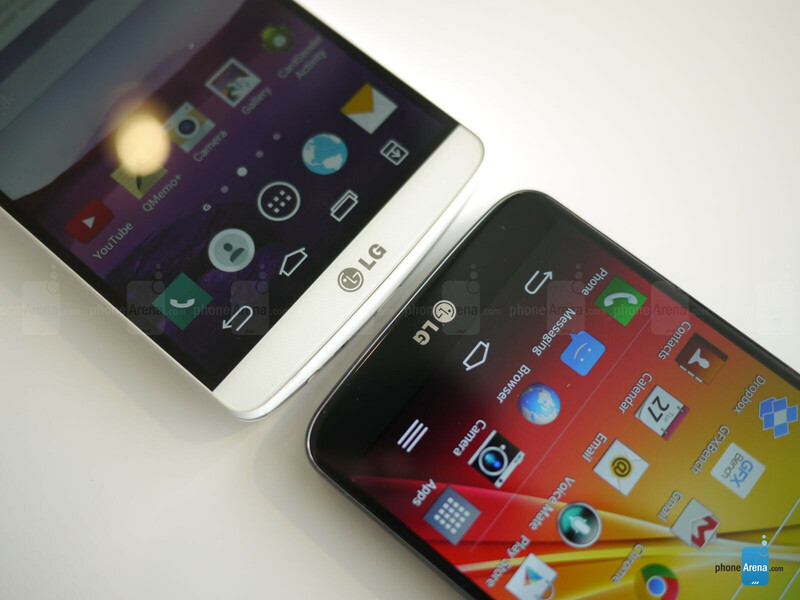 In terms of technology, both the new LG G3 and last year’s G2 use LCD displays with a regular RGB pixel arrangement. We can’t give exact measurements of color accuracy just yet (but we’ll have our color tests soon, so stay tuned! ), but what we can tell from first-hand experience is that the G3 has vibrant and rich colors, in the tradition of the slightly overblown tones of its predecessor. 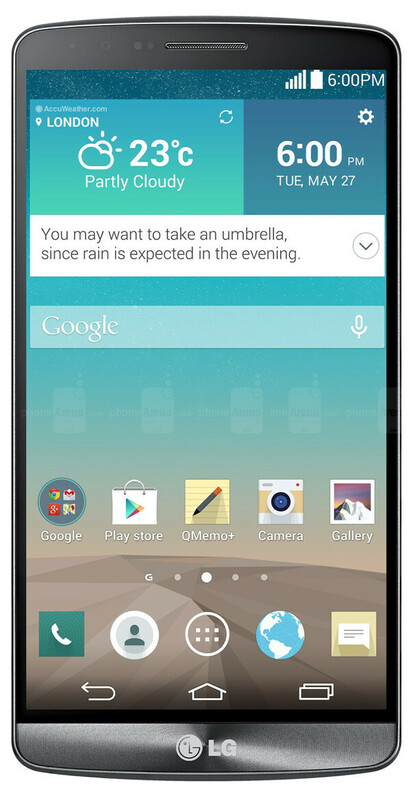 The LG G3 ships with the latest and most agile Android 4.4 KitKat version of Google’s operating system. The G3 has taken a hint from Samsung’s TouchWiz book, and it has touched up the looks of the Optimus UX to look much more colorful and flat, though, so the change from the G2 is very apparent with flat and color-coded icons in place of textual lists and menus. LG is calling this a ‘Simpler’ UX, but we’ll look at its usability in more detail in a separate article, so stay tuned. What’s changed, however, is not just the looks, but also - the functionality. With the G3, LG introduces its LG Health app, a health and fitness data aggregator that will keep tabs of your daily steps and activity, in a way similar to apps like Samsung’s S Health. The new Smart Notice feature will remind you to return a missed call, if you’ve forgotten to do so in a few hours, but it’s stand-out feature is its intelligent suggestions - instead of just telling you what’s the weather outside, Smart Notice will tell you that you need to take an umbrella. LG’s flagship also boasts an improved and customizable “Smart Keyboard” that learns as you type and is claimed to reduce errors by as much as 75%. Now, you can also change the size of the keyboards and even assign oft-used symbols to particular keys. Apart from these new software tricks that the G3 has learned, it will also improve on the existing features from the G2. Things like Knock Code (a multiple tap on a locked screen to unlock a phone) are now optimized to work better, and you have options like Content Lock to protect your private files, and Kill Switch to remotely disable your phone. An interesting innovation on LG’s part is its separate interface for LG’s new QuickCircle case, designed for the G3. Peek-view cases are nothing new, but the functionality in the peek window has usually been extremely limited, while the G3 has a much richer menu book with support for functions like calling, text messaging, music and camera, all possible without opening the cover. The G3 comes with a roaring new engine under its “polished metallic skin”, and it’s a 4-valve (yup, quad-core!) Snapdragon 801 system chip that does all the heavy lifting. It’s not Snapdragon 805 as some speculations hoped for - the 805 is apparently not ready for prime time just yet - but it’s the most powerful chip on the market now, and it’s a step up from the Snapdragon 800-powered G2. Also, it’s worth pointing out the slight difference in models: the 16GB G2 ships with 2GB of RAM, while the 32 gig model has 3GB of RAM on board (all of this compares with 2GB of RAM on the G2). It’s hard to say, though, that there’s a huge difference in perceived performance, especially in trivial daily tasks, as this is something that depends more on software optimizations than on chips, at least for flagships these days. Put simply, both phones are very snappy. Internal storage - as we already pointed out - starts at 16GB, but you can also expand on that via microSD cards of up to 128GB in the G3. This is good news, especially given that the G2 did not have a memory expansion slot. At first look, the shooter on the LG G3 does not seem to have changed much from the one in the G2 - both have a 13-megapixel main camera and optical image stabilization, but the devil is in the detail, as they say. Upon closer inspection, you’d see that the G3’s camera is more similar to the one in the G Pro 2 actually. There are differences in the way photos appear in terms of color reproduction, but the G3’s shooter also comes with a sizeable improvement in terms of shooting speed and stabilization capabilities. Focusing gets a helping hand from the laser assist light, and is more precise, especially indoors where light is scarce. For videos, the G3 camera gets the new 4K UltraHD recording mode, and the OIS+ technology brings a noticeable improvement in the stability of recorded footage. The LG G3 is the first device with a Quad HD (2560 x 1440-pixel) screen, an extremely sharp and good looking display, but it brings a host of other improvements and is overall a substantial upgrade over last year’s G2. Starting from the more powerful Snapdragon 801, the improved 13-megapixel camera with OIS+, and the hugely reworked user interface, the G3 is better than the G2 in almost every conceivable way. It is, however, considerably larger, maybe too big for some. If this does not bother you, though, we expect the G3 to grab the hearts of geeks and non-geeks alike. The sd card is the 1 thing I miss having on my G2. 1080p videos are huge in file size. It is the only complaint I have against the G2. Where have you been for the last year? People said this about the G2 and that phone was successful for LG. I guess you haven't seem too many G2 reviews. A lot of them said it's not very comfortable like they claimed but they got used to the bottom in the back of the device. G2 was successful bc it was a good phone and good design with great battery life. Nothing to do with bottom in the back. I guess even LG is not immune to the "no phones at launch" trend that seems to be popular. 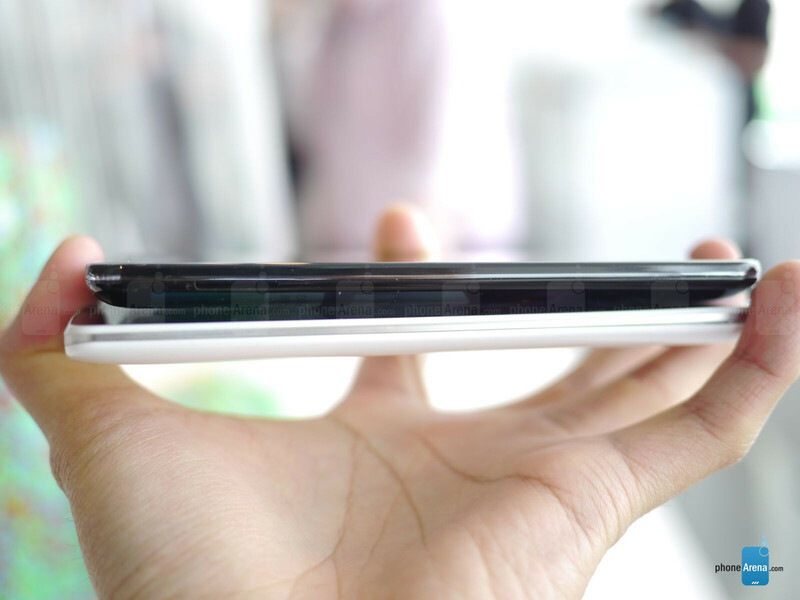 Looks like a very solid phone, but most people won't be able to buy it for a while, 2-3 months or longer. Good thing I got my "bait and fake" training with OnePlus earlier this year.